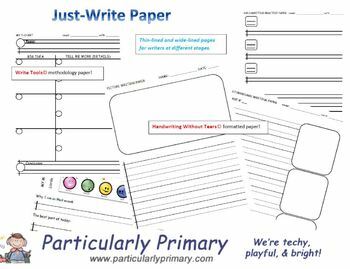 Here is a collection of paper that will enable young writers to put down their ideas neatly and creatively. It uses the Handwriting Without Tears structure. It also offers a unique T-Chart based on the Write Tools method of composition. A diary page is included and is perfect to add to student portfolios after they record their daily reflections. Three different sizes of paper are included for writers in different stages of handwriting (beginner, thick, thin). Print out and photocopy all or some of the pages as needed, and keep a stack handy in your classroom!